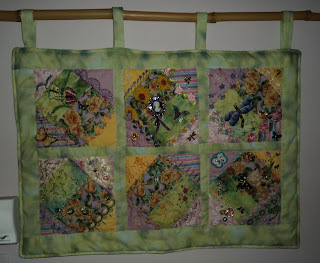 Chef Tiger's Kitchen: Spring is Sprung finished wall hanging! I was feeling a little down today so decided to work on putting together my wall hanging with all the fabulous blocks that the ladies did for my Spring is Sprung Wall Hanging. Click here to view a larger picture. Many thanks go out to Cathy, Colleen, Helina, Margreet and Ritva for there fabulous work on these blocks. I've even found a great place to show off everyones work. Right at the top of the stairs where no one will miss being able to see it. That is so lovely! All the ladies did such lovely works on all the blocks! And talk about a lovely presentation too!!! This is so pretty! I love how you put it together, it's beautiful! Hope this lifted your spirits and tomorrow will be a better day! That is really nice for Spring is Sprung. I can see why it cheered you up while you were sewing those lovely colours. How lovely Lorrie! Such a treasure - I'm glad you kept this for yourself. You deserve it!